Popular support and the state’s superintendents are helping sustain a historic strike. Early on Monday morning, just as schools would usually be opening across West Virginia, the Ohio County Board of Education gathered in an auditorium in Wheeling Park High School to hear comments from local parents and the school district’s employees on the state’s teacher strike. Rather than apply additional pressure to the strikers, county school boards across the state have taken steps to cushion any financial blow that might come to teachers because of their participation in the protests. Paychecks have continued to flow, unaffected. In a recent 3-2 vote, Ohio County’s board agreed to waive attendance-related requirements that could have stripped strikers of a $1,350 bonus-like payment they typically get at the end of the year. West Virginia’s county school boards have, so far, largely stood with the teachers in their quest for higher pay. A delegation of all 55 of the state’s superintendents, one from each county, spent hours in Charleston over the weekend, fruitlessly pressing a key Senate committee to approve the 5 percent pay raise. “There’s not a single superintendent in the state who is opposed,” Rick Jones, Ohio County’s assistant superintendent, told Mother Jones. Support for strikers isn’t hard to find in the county, home to the Ohio River town of Wheeling, West Virginia’s 5th largest city, and some of the state’s highest test scores and per capita incomes. 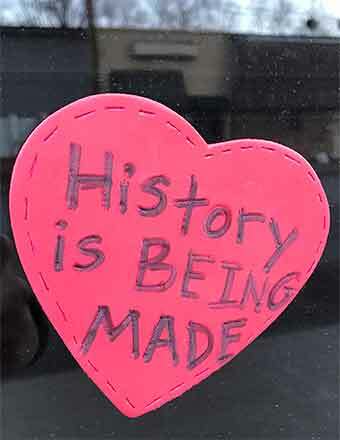 School board workers have taped heart shaped messages of solidarity—”Without teachers, there is no future;” “History is being made;” “Proud to be from WV”—across the windows of the school board’s downtown offices. Cars freely honk in support of roadside demonstrators. On Monday, teachers picketing outside empty schools found the sidewalks chalked with encouragement from their absent students. West Virginia teacher salaries are the nation’s 48th lowest. And at Monday’s board meeting, several parents took the microphone to express solidarity with the teachers. One, Megan Kirchner, likened the strikers to Cesar Chavez and Rosa Parks. Another, Nikki Kiger, said she was praying for a change of heart on the part of the state senators who voted against the latest deal. There’s no denying the strike has been disruptive, but according to Raquel McLeod, a student services administrator, the district has taken steps to ensure that vulnerable students still have access to support, such as counseling, during the work stoppage. Special ed students have been meeting with district help at a local McDonalds, and administrators and local social service agencies have arranged take-home bags of food for children who receive free lunch during the school day, with menus designed to be simple enough that the students can prepare the food for themselves. With the state’s teachers saying they are ready to stay out of school until a satisfactory deal is reached, the rituals that mark spring in the state’s schools are at risk of cancellation: the boys and girls state basketball tournaments, speech competitions, school plays, even graduation. With no end to the strike in sight, Ohio County officials are rushing a plan, in cooperation with the teachers’ union membership, that could be in place as early as Wednesday to allow students, teachers, coaches, and other advisors to return to facilities for after-school activities, but not classes, in the afternoon. (Teachers’ extracurricular contracts are separate from the state’s classroom contracts.) “We are literally hurting our kids if they can’t have practice,” said Jones. West Virginia’s last major teacher strike in 1990 played out very differently, according to Kim Martin, a physical education and health teacher at Wheeling’s Triadelphia Middle School. Then training for her license, Martin took part in the 1990 work stoppage alongside her mentors, as the district’s superintendent staged classes with a skeleton support staff and a smattering of instructors willing to cross picket lines. The incident left long lasting rifts in the district, between teachers, administrators, and the workers who helped reopen the schools. “One good thing is that this time our board of education has tried to keep us together,” says Martin. Speaking at a picket outside Triadelphia Middle School, Mindy Tripp, the vice president of the county teachers’ union and an eighth grade science teacher, stood on the sidewalk with dozens of her fellow teachers, her voice contending with honking cars and upbeat music blaring from the strikers’ own speakers. She says support for their cause boomed after the state Senate’s Saturday night vote. “Out in the community, people come up to me when I’m wearing my red shirt, telling us to see this through,” Tripp says.